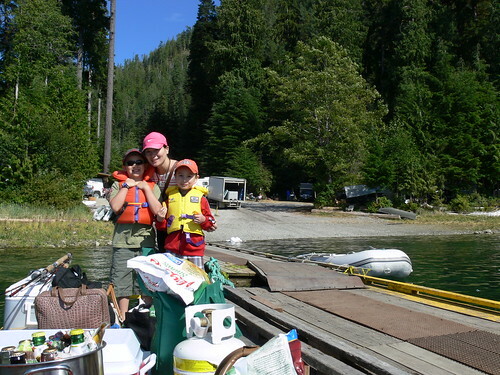 Every year we make the trek from Port Coquitlam, BC (near Vancouver) over to Critter Cove to meet up with other family members and do four days of intense fishing. The trip there takes about a good part of a day as it involves a drive to Horseshoe Bay a ferry ride over to Nanaimo and then a drive up to Campbell River where we team up with the rest of the family to continue to Gold River and finally Cougar Creek. There we get on the boat and head to Critter Cove. It’s a long journey but totally worth it. The most painful part of the trip is waiting for the BC Ferry in Nanaimo. We always buy reservations for the ferry ($15) to ensure we get on the sailing we want as it tends to get very busy and waiting in the car for hours with two small kids isn’t a good way to start any vacation. We normally spend a day or so in Campbell River where we transition from city mode to island mode. It takes me quite a while to get the worries of the city out of my mind. Once in Campbell River we enjoy a trip to the lake and the public pier in the evening where we eat a waffle ice cream cone. Tiger Tiger is my favourite flavour but the kids like Bubble Gum and Cotton Candy. Names like these make me wonder what sort of cows delivered the cream for this ice cream. Campbell River also has a surprisingly good public market on Sunday which is located right next to the public pier. After we are rested we follow my brother and his boat to Gold River where they launch. To save boat fuel we take the SUV down the logging roads for about an hour with all our gear and meet them on the dock at Cougar Creek camp ground. Most of the road is gravel but it has greatly improved over the years. We pay to park the vehicle at Cougar Creek camp ground for four days. The camp ground there is really nice and on the beach of the inlet. It is as beautiful as it gets and very remote. The managers seem very nice and organized. If I was camping, I would stay there. Waiting to load the boat at the Cougar Creek Camp Ground dock. When my brother arrives, we load the boat and head out to Critter Cove. We reserve two rooms at Critter Cove each year as there is a long line up of people waiting for availability. 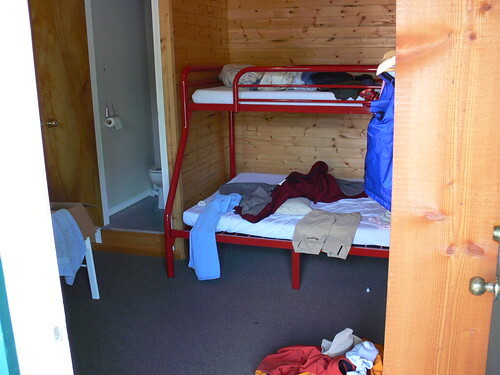 Each room is actually a single private room with a bunk bed, small table and a toilet. There are several rows of cabins on various parts of the dock and each one has several of these rooms. There are also some really nice cabins on the beach for those who need a bit more room. For our needs the room is all that is needed for a fishing trip. The rooms have flush toilets, running water for washing up, a mirror, closet and it is clean. 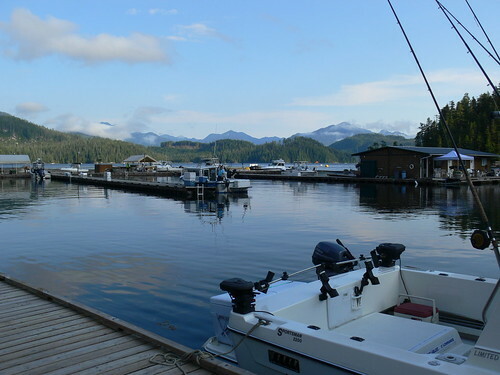 The dock also has pay hot showers (which feels like heaven after several days of fishing), laundry, freezer service for fish, ice sales, tackle sales and a good restaurant which opens very very early. I have personally enjoyed many good dinners there, a few ice creams and the most delicious strawberry milkshakes. The owners are always there and provide great service. It is a family run operation and that shows. The cabin we stay in each year. The bunk bed maximizes floor space and is actually quite comfortable. The kids fishing on the dock. Most years there are hundreds of mackerel for them to catch. As the sun gets closer to setting the fishermen begin to return to prepare for the next day. The trip first began as a tribute to my father who passed away a few years ago. 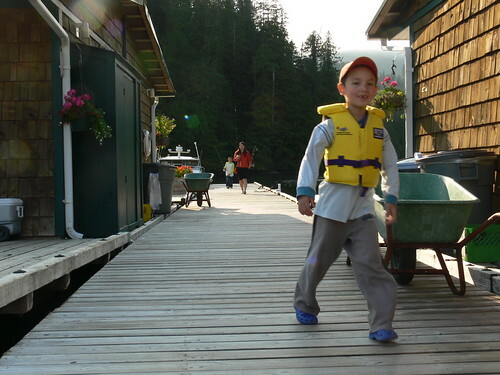 He was an avid fisherman and Critter Cove was one of his favourite vacation spots. My brother and his family have been going there for many years and have a great boat for the wild west coast weather. I was glad my brother invited us to join them that first year for a few reasons. First, there is no cell phone signal so I have zero chance to be distracted by updating my Facebook, or Twitter feed. I can’t check emails or do anything online. I am free of technology which allows me to focus on what is important, my family (and fishing of course). Also, we take our mum with us which is a really great addition. With my boys, my brothers family and my mum we have quite the family reunion. What started as a way to honour and remember my father has turned into a great way to see family again without the distractions. My brother is in his element when his feet are in a boat. If you were to see us out in the boat you might not think we were having a typical family reunion but it is our style of getting together. One person sets the hook, another gets the net and another bonks the fish on the head. We celebrate the catch and then quickly position for another. It’s really the Sell family style to keep moving and focus on the tasks at hand. Conversations come out and we do talk a lot as we drive along, gut the fish or clean the boat. We actually end up sharing a lot in those moments between watching the rods and resetting the gear. Each year is different. 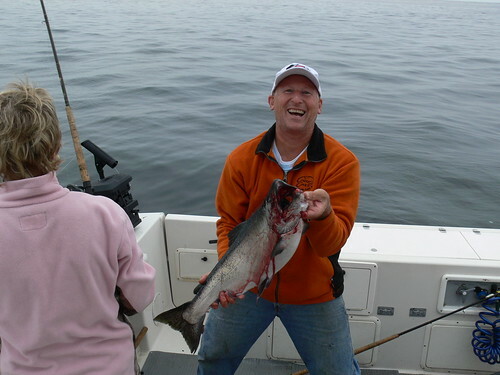 One year we caught a lot of large Spring salmon, another year was Halibut and this year was a good mix of Sping, Coho, Snappers, Cod, Halibut and Ling. My brother even brought out the prawn traps this year. A collection of bottom fish. 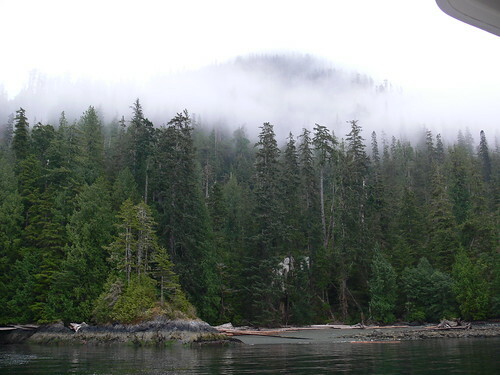 Nootka Sound is an amazing place. Having grown up on the ocean in the Georgia Straight I am used to eating mussels, oysters and clams but everything is giant size on the West Coast. The fish are bigger, the mussels are bigger and the waves are bigger. To catch the big Halibut and bottom fish we have to go far offshore where the rollers really mess with your equilibrium. If the fog rolls in and you lose visibility it doesn’t take long before I am tasting my breakfast. I tried Gravel but it was a terrible experience and made me very sleepy. I was then introduced to “the patch” (thanks Erin!) which is a small round patch you can put on your skin behind your ear. It works very well and has less side effects. I wore it last year and tried it again this year but felt uncomfortable this time. I think it may have been because we bought the no name brand this year. I ended up taking it off and just feeling sick half the day from the rollers. I figured throwing up was a better alternative to having weird chemicals in my head. Everyone else in the boat was fine and enjoyed watching my face change colours. This year we spent a day offshore and caught four good sized Halibut. I was lucky enough to get the largest one on my rod. To be fair my brother and his wife Jan spend most of the time driving the boat and baiting the hooks so I could get a lot of rod time. Halibut are as heavy as hell to bring up from the bottom and fishermen are generally quite cautious to bring them on board as they are pure muscle and can break your legs when they jump around the deck. So, as the large glow of the white skin started to become clearer as it came closer to the surface my brother reached for the hand harpoon. A gift from my father, the hand harpoon is like a very large spear with a head that detached once it penetrates through an object. A rope is tied to the head of the spear so once detached, the fish is basically tied to the boat. Some people have a float tied to the end of the rope but we have never had a need for that and just tie it to the boat. After fighting with the Halibut my arms began to burn but I knew it was going to be in harpoon range in seconds. I saw my brother wind up and launch it through the air. He is really strong from years of commercial fishing so the harpoon hit the water with a crash. To my shock, it bounced off the head of the Halibut. My brother and I looked at each other in dismay as the reel screamed line. The harpoon had hit the bony part of the cheek of the Halibut and not penetrated. Instead, it had simply made it upset and more aware of its impending fate. The line continued to fly off the reel for what seemed like a long time. My brother was grinning as he knew I had a lot of work to do to wind it all back in. I began pumping the rod up and down to get a little less tension on the line as I reeled it back in. 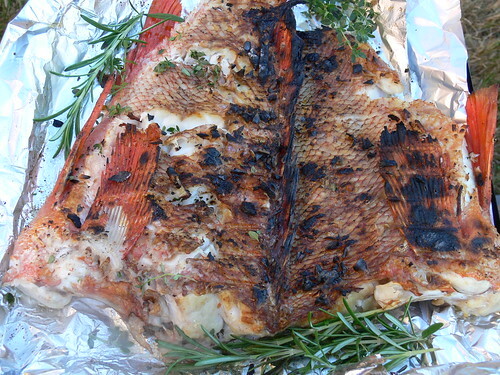 After a few more minutes and burning arms the Halibut was along side the boat again. My brother focussed and slammed the harpoon down again on the head of the Halibut. Blood and water exploded out of impact area and we knew the hit was solid. As we began to relax, the reel started screaming line again. My brother and I looked at each other and then at the end of the harpoon. It had definitely penetrated the Halibut but had not detached after going through. We couldn’t help but laugh. My arms were already burning and now I was going to have to reel this big fish in all over again for a third time. I was almost ready to pass off the rod to someone else but my pride wouldn’t let me. As I slowly brought the fish back up from the depths my brother fixed the harpoon. By now I was exhausted and my fingers were sore from getting smacked by the reel. I finally brought the Halibut up for the third time and my brother drove the harpoon through the head of the Halibut with even more force than the last two times. With an explosion of blood and sea water the Halibut let us know it was not happy. It smashed the water with all the strength it could muster in a final effort to break free. Like a blender with the lid left off, foamy salt water and blood sprayed everywhere. The harpoon rope held and it was no longer taking line from the reel. We drove the gaff into it and dragged it on board once it calmed down. After marking the spot on the GPS we baited up and got three more (but not quite as big). Instead of eating at the restaurant each evening this year we brought a camp stove and cooked some of our meals. I thought this might not be very convenient as we were always exhausted after a long day on the ocean but it turned out to be really fun. The docks are full of people preparing for the next days events. Everyone has a picnic table and some people bring gazebo tents for shade. Beers and wine are shared and everyone talks fish. “What are you using and where are you going tomorrow?” “What sort of boat do you have and where are you from?” Most people are Canadians but there are also a lot of Americans from the Seattle area. We recognize a lot of people who go year after year as we have. My kids fish off the dock and buy ice creams from the restaurant during the day if we come in at lunch time. My mum typically stays at the cabin for the morning shift and then joins us after lunch. This year she caught a really nice sized Spring salmon (King salmon if you are American) and brought it in her self. She has been fishing longer than I have been alive so not sure why I should be surprised. 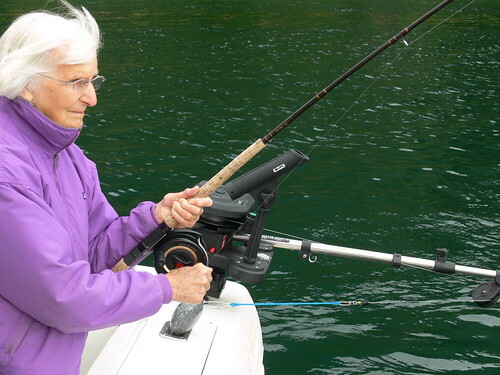 She is 82 and handles the rod like a pro. Seeing her on the rod made me so proud and brought back memories of sitting in a small boat watching my parents fish. My mum. Not only an awesome mum but a damn good fisherwomen. On the the last day we usually get a few hours of fishing in and then pack our gear and head out before lunch time. While I am always sad to leave, I am also a bit exhausted and looking forward to a good shower. Once home, we take half a day to process the fish. Everyone helps. My brother typically butchers as he is fast at that while others use the food savers to bag the fish. While the fish are already cleaned and on ice we need to cut each one into meal size pieces and then use food savers to bag each one. 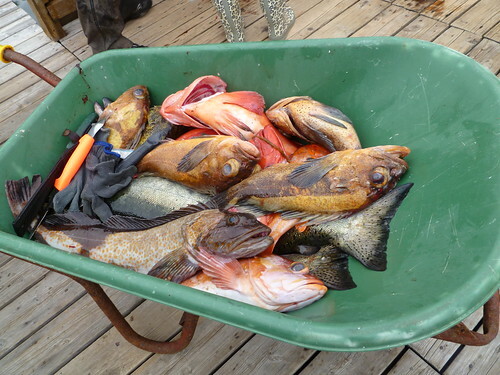 We then freeze the pieces of fish like this for transport. Once home we will smoke some, pickle a bit and eat the rest on the BBQ. For the last three years I have been doing this trip with my brother and his wife. Going with people who really know the area and have a great boat makes the trip so much easier. 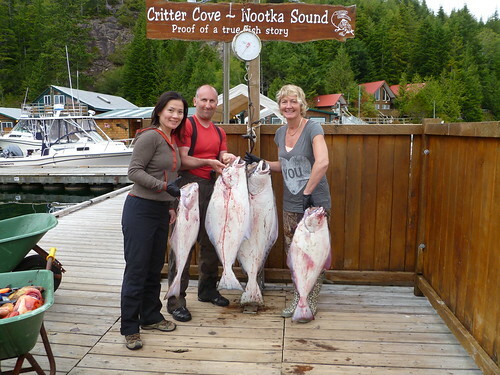 If you are serious about fishing, I highly recommend checking out the Nootka Sound area.